There was a weekend discussion over this article by the standard which looked at the different prices paid by the Kenya Tea Development Agency (KTDA) as tea bonuses to farmers in different parts of the country. KTDA had just announced a record Kshs 84 billion earnings from small holder tea farmers for the year, a 32% increase of which 62 billion will be paid out to tea farmers ar a rate of Kshs 50 per kilo on average. (25% covers the costs of production). Few could believe that farmers in Ketch, the widely accepted centre of Kenya’s tea could earn half of what farmers in other regions get. Farmers in Kericho and Bomet have complained of low bonuses they expect (South Rift farmers will only receive Kshs 13 billion). KTDA’s region five comprises Kericho and Bomet counties with seven tea factories and an equal number of satelite factories. From the region, the highest paying factory, Momul, will give farmers Kshs 35 per kilo of green leaf as bonus, while the lowest paying, Litein and Chelal, will pay Kshs 26 per kilo. 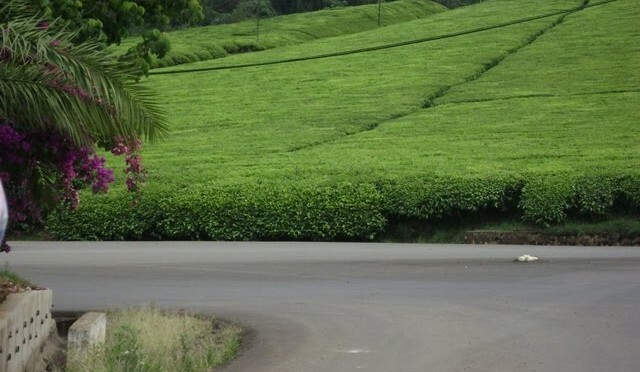 In the Eastern region, also known as Region Three, however, the highest paying Munuga Tea Factory will pay suppliers Kshs 48.35 per kilo of green leaves as bonus. A farmer threatened that they would break away from KTDA and establish a new tea auction in Kericho. 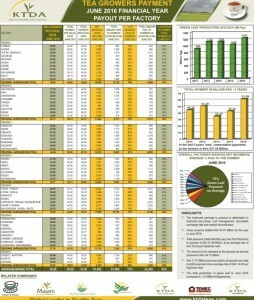 “There is no doubt that Mombasa Tea Auction is controlled by cartels who manipulate tea prices. Kericho Governor Paul Chepkwony says they will source for tea markets in the US, UK, China and West Africa. “Our idea is the direct tea sale concept, which has been tried successfully by the management of Kokchaik Sacco which, through Finlay’s Tea Company, earns $3 (Kshs 303) per kilo. There is no reason at all why KTDA should pay farmers as low as Kshs 26 per kilo of tea as bonus,” says Chepkwony. Each factory had a specific rate (bonus) which it pays to its farmers based on the factory directors’ approval. KTDA is a tea marketing agency..owned by smallholder farmers who hold shares in their respective tea factories .. and 560,000 smallholder tea farmers in Kenya are shareholders of KTDA through their factories. 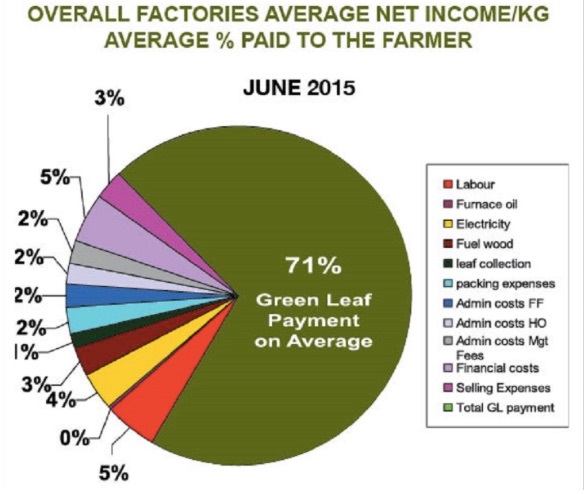 It is important to note that farmers receive monthly pay at the rate of Kshs 14 per kilogram of green leaf delivered to the factory in addition to the 2nd payment (bonus). Factories process varied volumes of tea depending on the size of the catchment areas and the volumes of tea produced. This determines factory capacity utilisation and hence cost efficiency. Teas from the factories also fetch different prices at the markets – either through the auction or direct markets. Consumer preferences also affect pricing, with some markets preferring teas from specific factories. The quality of green leaf is further determined by ecological and climatic features such as types of soil and quantity of rainfall, as well as the quality of farm management practices such as application of fertilizer, pruning and plucking. Further, the cost of production varies from factory to factory based on labour and energy efficiencies, cost of credit and investment income. Factories with expansion projects that are financed by loans will incur higher finance costs than those which are not expanding. Given the current interest rates regime, such costs can be substantial. On the other hand, factories with healthy cash flows and which have no need to borrow will ultimately invest their surplus and earn more income. It is this combination of factors that determine what income individual factories pay their farmers. (that) Historically, factories around the Mt Kenya region have fetched higher payments than those in western Kenya based on a skewed marketing concept and buyer preferences at the auction. (also that) Factories west of the Rift Valley are highly indebted to banks for loans to expand processing capacities to match increased acreage. 11 factories in the Western Rift are satellites (do not enjoy full status) which means they cannot market their tea at the weekly Mombasa auction, and neither can they elect directors. The area planted with tea increased by 3.2% from 203 thousand hectares in 2014 to 209 thousand hectares in 2015, primarily from small holders. Despite the increase in area under tea, production decreased significantly by 10.3% from 445.1 thousand tonnes in 2014 to 399.1 thousand tonnes in 2015. The unit price of one Kilogram of tea recorded 42% increase to Kshs 293 in 2015 due to international supply constraints. Tea was the leading source of foreign exchange with revenue from the commodity rising by 31% to Kshs 123 billion in 2015. This entry was posted in Farmers, Investing in Kenya, Kenya tea, Kericho, KTDA and tagged Tea on September 19, 2016 by bankelele.